To many in the outside world, Silvio Berlusconi is the clown prince of politics – better known for his bunga-bunga parties, outrageous comments and courtroom battles than for any obvious political nous. Within Italy, though, the former prime minister remains a potent political force. His centre-right People of Freedom (PDL) party has been gaining ground, and he may well be in the reckoning when this weekend’s election results roll in. So, what is the secret of his enduring attraction? Some of his faithful followers in Italy’s affluent north explain why they have stayed loyal, despite all the scandal. Another, meanwhile, explains why he has finally had enough. Mr Bianchi describes himself as one of life’s “gypsies”. He’s travelled the world during a career that’s included the Italian diplomatic service, shipping and finance industries. He now works as a training consultant to big firms from his home in Milan. Mr Bianchi has been a Berlusconi fan since the former cruise-ship crooner exploded onto the political scene in 1994 – and he remains one to this day. He even supports Mr Berlusconi’s AC Milan. “This was a man who’d come from virtually nothing to be a big success in building, finance, the media – and had spotted a gap in the political market. He also opened up politics – to businessmen, academics and managers. And I like his easy way with people. What he’s found, though, is that the Italian political system is very difficult to change, because of the resistance of the political system and vested interests. “The way he’s been attacked over the years has infuriated me. They started out trying to attack him on issues that seemed important – and when that didn’t work, they ended up talking about the girls and the parties. Mr Ferri is single, and a marketing graduate. Home is a small village called Comun Nuova, in the Po valley. His day starts at 06:00 in the morning, when he sets off for work at the nearby Tenaris steel plant. Four evenings a week he studies for his masters degree in international marketing. “Berlusconi’s no saint, we all know that. But there’s a saying in Italian – ‘ci mette la faccia’ – which basically means someone’s not afraid of a fight, of taking a risk. And that’s Berlusconi all over. He has no fear. “Before he came back as leader – just before the election – the PDL was down and out. Now it’s back and fighting hard. 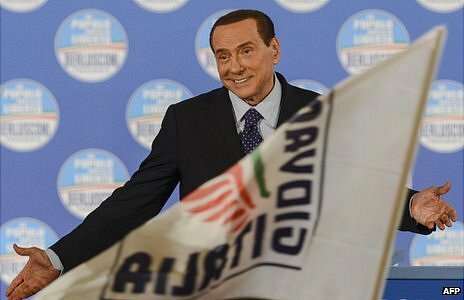 The PDL might still lose – but it would have been a lot worse without Berlusconi. “Berlusconi is the only one who knows how to talk to people about their real problems. You know, we’ve businessmen round here who’ve lost everything they’ve worked to build up over the past 40 years – men who can’t even afford a decent meal any more. Ms Birolini is running for election to the Lombardy regional council on the PDL ticket. A 43-year-old mother of two, she’s passionate about culture, the importance of rooting out corruption and the role of women in Italian society. How does that sit with her place in a party led by a man known for constant corruption allegations – and a taste for dancing girls? “Berlusconi is not the PDL. The reason I’m in the PDL is because it represents freedom of choice – and it’s only by the exercise of choice that you become a better citizen. Berlusconi did a lot for the country in his first 10 years. But after that, I think he got misled by some of those around him. “It’s really difficult to be a woman in the centre-right at the moment because some of the examples in the past were so bad. We’re all ‘messo nello stesso cappello’ – thrown together in the same hat. It’s my personal battle to show that a woman can make a valid contribution politically, that there’s a different way to be a woman in politics on the centre-right. It’s a heavy responsibility – especially at a time like this. Mr Marieni is a property owner and retired manager, whose family home is in the town of Bergamo, just outside Milan. He’s a firm believer in free-market liberalism – and had great hopes for Silvio Berlusconi when he first appeared on the political scene. But this time, he says, he won’t be voting PDL. “I voted for him because he seemed to be the only person who could prevent Italy being taken over by the communists or ex-communists. I think he had a genuine desire to renew the country – to slash bureaucracy and shake up the public administration, education and health. He also saw the need to modernise our infrastructure in order to catch up with the rest of Europe – everything from high-speed train networks and motorways to nuclear power plants and high-speed internet access. “But the establishment – most of it on the left – was against all this – and so started the battle against him – like antibodies fighting off alien intruders in the body.